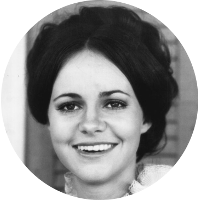 Sally Field is an American television and movie actress. Her television career is probably best remembered for her roles on the sitcoms Gidget and The Flying Nun. She later moved into films starring in Smokey and the Bandit, Norma Rae, Places in the Heart, Mrs. Doubtfire, Steel Magnolias and many others. Sally Field has been nominated for numerous acting awards including winning two Academy Awards for Best Actress. Sally Field is a direct descendant of Mayflower passenger William Bradford. She has kinship to a number of notable U.S. historical figures that include dictionary publisher Noah Webster, Declaration of Independence signer John Hancock, U.S. Constitution signer Nicholas Gilman, and Boston Tea Party participant Amos Lincoln. Her Presidential kin include Abraham Lincoln, Franklin D. Roosevelt, Gerald Ford, and both Presidents Bush. Sally Field has a number of fellow celebrities as kin. These include Bing Crosby, Clint Eastwood, Humphrey Bogart, Alan Ladd, John Lithgow, Keri Russell, Kyra Sedgwick, Ted Danson, Christopher Reeve, and Hugh Hefner. Literary kin include Henry David Thoreau, Robert Frost, and Tennessee Williams.